Home to some of UNESCO World Heritage sites, Ireland is a small country with a lot to offer. Whether you choose to explore the historical sites or you are just exploring the wildlife. Hiring a car in Ireland is the ideal way to explore both the rural countryside as well as cities. The country has a wide range of attractions to suit a number of tastes. To be considered a World Heritage Site, a particular site must be of outstanding universal value and meet at least one out of ten selection criteria. The benefits of a site being selected as a World Heritage Site include funding for protection, tourism, a worldwide identity and protection under the Geneva Convention. The island of Ireland has three UNESCO World Heritage sites, with another 7 sites submitted for consideration. UNESCO describes Skellig Michael as a monastic complex, perched since the 7th Century on the steep sides of the rocky island of Skellig Michael. The ascetic monks that inhabited the island were seeking a greater union with God and withdrew from civilization. While the monastery seems to have moved to the mainland during the 13th century, the island was still used as a place of pilgrimage. The island is exceptionally well preserved given its remote nature. Skellig Michal is located 12km off the coast of Ireland. 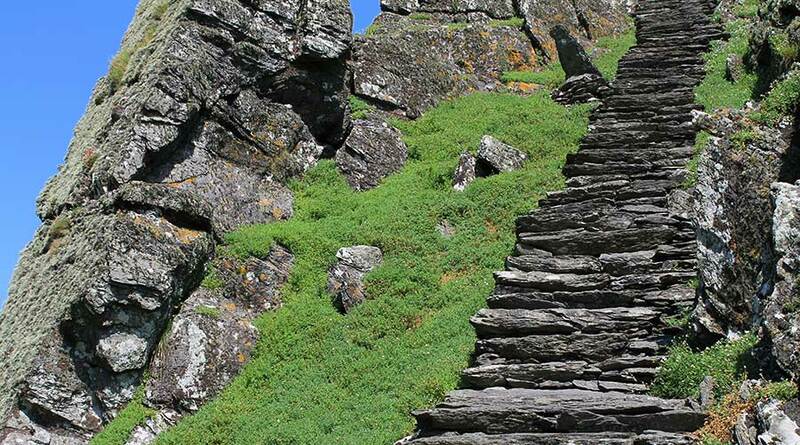 Visitors to Skellig Michael will see and understand the meagre lifestyle Monks endured. Next to Skellig Michael sites Little Skellig, an uninhabited Island that is home to thousands of birds. The islands are spectacular pinnacles and can be seen from Valentia Island off the Ring of Kerry. The Skellig Experience is located on Valentia Island, and seeks to make more accessible the treasure of Skellig Michael. The center explains the architecture of Skellig Michael, the bird life that calls the island home, the lighthouse on Valentia Island and the waterscape around the Skellig islands. Beside Skellig Michael is Little Skellig, an uninhabited island 1km to the west of Skellig Michael. The island has a large bird population including a colony of northern gannets, the largest bird in Ireland. In total there are circa 35,000 pairs of Gannets on the island. Access to this protected island is through BirdWatch Ireland only! Visiting Skellig Michael is not for everybody! There are 600 steps from the dock to the monastery. 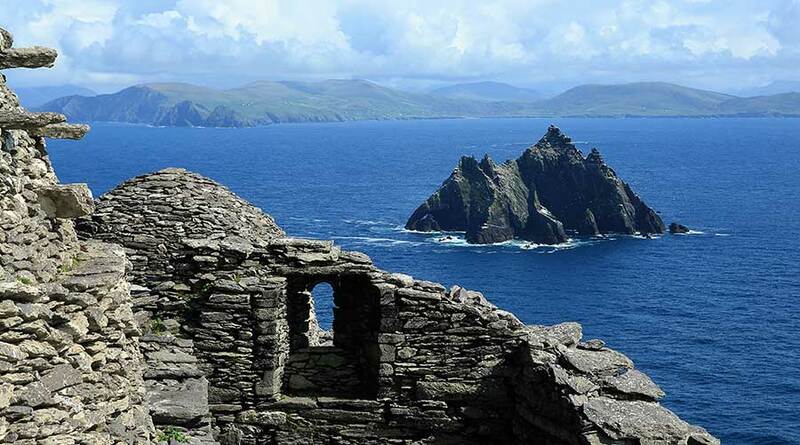 People considering visiting Skellig Michael are asked to give this fact careful consideration. In addition, it is recommended that visitors are prepared for rain or changeable weather. Also, a trip will take circa 5 hours to complete. Visitor numbers to the island are restricted, so book in advance. Many customers will hire a car in either Shannon Airport or Dublin Airport and make a visit to Skellig while touring the Kerry area. Boats to the island can be taken from Valentia, Portmagee, and Ballinskelligs, leaving in the morning and returning in the afternoon. UNESCO described this as Europe’s largest and most important concentration of prehistoric megalithic art. In addition UNESCO described these monuments as having social, economic, religious and funerary functions. Brú na Bóinne means the Palace of the Boyne, and is situated along a bend in the River Boyne. 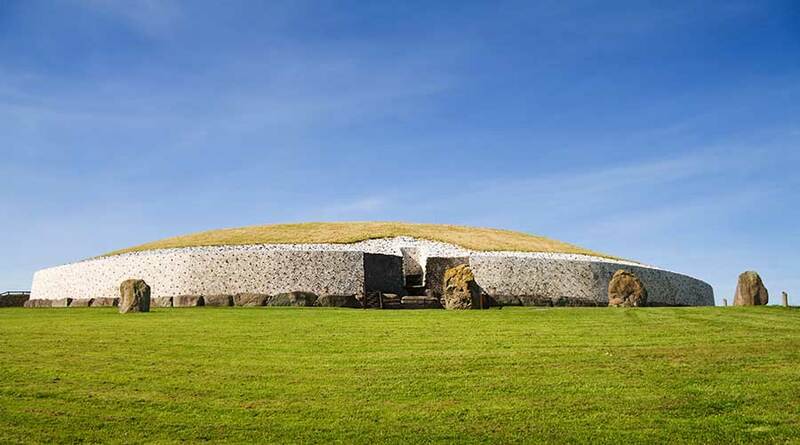 Principally, the name refers to Newgrange, but there is a total of three prehistoric sites making up the entire complex. The visitor center and Newgrange is open all year round except Christmas. Knowth is open only during the summer months. Tickets to the visitor centre and Newgrange are sold on a first come first serve basis and it is advisable to arrive as early as possible. Newgrange is a tomb, and pre-dates the Egyptian Pyramids. The complex was built in 3,200 BC. While any structure of this age is an impressive site, what makes Newgrange special and mysterious is that on December 21st each year, when the sun rises a shaft of light passes through the passage way and lights up the tomb. This feature is twofold, firstly it is a way of honoring the dead, and secondly it informed the pre-historic inhabitants of the area that this was the shortest day of the year! 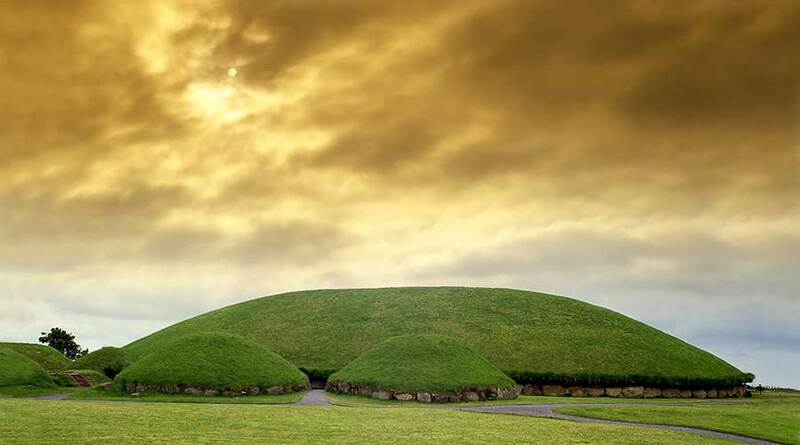 Driving is the best way to get to the Newgrange and you can get a car from Dublin Airport car hire office nearby for at cheap prices. From Dublin, take the M1 north and exit at junction 9 which is the second exit after the toll. There are signs directing you to Donore and Brú na Bóinne. Go through the village of Donore and the Visitor Centre is 2km past the village on the right-hand side. Dowth is similar in size to Newgrange, but was subject to a very amateurish excavation in 1847. Two passage tombs were discovered, but the mound was severely damaged in the process. The passages are shorter and have lower roofs than Newgrange. There is no access to Dowth. Knowth was built after Newgrange, but before Dowth. The mound is similar in size to Newgrange and is surrounded by 18 satellite mounds. There are two passages at Knowth, one standing at 34 meters long and one at 40 meters long. The Visitor Centre is located 2km west of Donore Village. From Dublin Airport, follow the M1 North. Take exit 9 and follow the L1601 to the Brú na Bóinne visitor center. The Giant’s Causeway is located in Antrim, close to the town of Bushmills in Northern Ireland. UNESCO described the rock formation as a dramatic sight that has inspired legends of giants striding over the sea to Scotland. The rock formation was caused by volcanic activity some 50 million years ago, when intense volcanic activity and highly fluid lava was forced up through fissures in the chalk bed to form a broad lava plateau. The lava cooled rapidly, and variations in the rate of cooling created the column structure that is so famous today. The columns are mainly hexagonal in shape, and in total there are over 40,000 columns. The causeway offers a chance to walk along this plateau, and see the column structures up close. In addition, there are several walks in the area. The visitor center at the Giant’s Causeway provides visitors with practical information and maps. In addition, visitors can learn about the local wildlife, the history of the rock formation and the legend of Finn McCool who it is said builds a bridge to Scotland, but once there changed his mind! 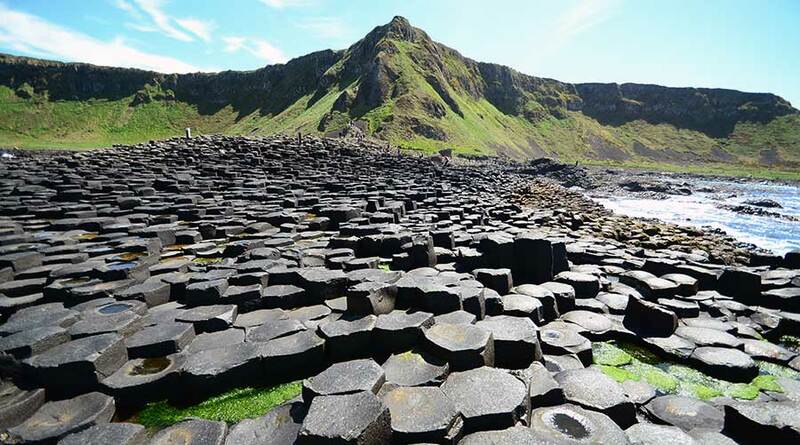 The Giant’s Causeway is located near the town of Bushmills. Customers who have rented a car at Dublin Airport or in Dublin City Centre will travel northwards on the M1, continuing past Belfast, through Ballymena and on to Bushmills. The Burren and Cliffs of Moher Geopark have been added to the UNESCO tentative list in 2010, this means Ireland intends to consider for nomination to the World Heritage List. The Burren National Park & surrounding area is a large region covering approx 360 square kilometers, located on the west coast of Ireland, County Clare and one of Ireland’s six national parks. 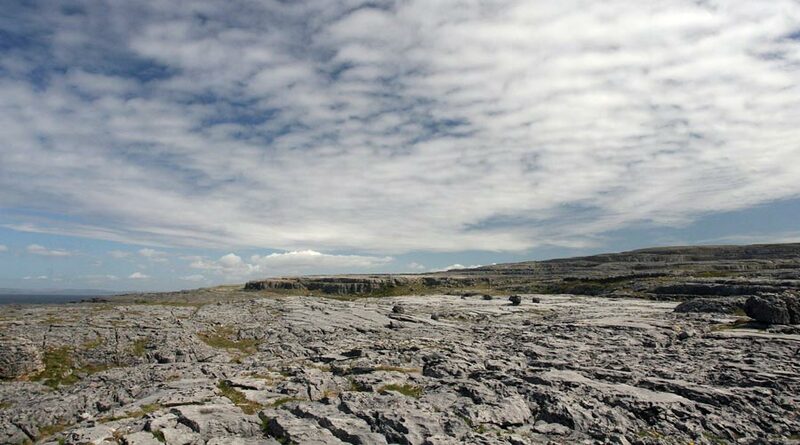 There is a Burren scenic drive which you can do to explore the region. 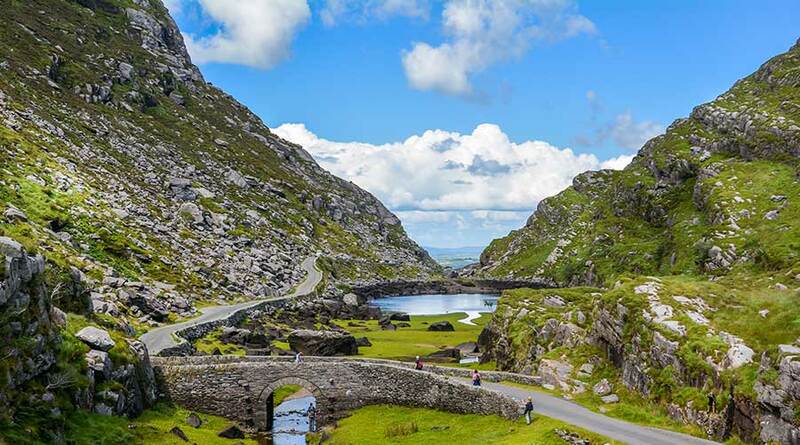 If you are interested in driving in Ireland, check out these driving routes informational guides we have developed for you. To drive a car in Ireland a full international driving license must be held. Ireland has speed limits of between 100km/h on national roads with a limit of 120 km/h on motorways. Many of Ireland's rural and scenic roads are narrow so caution is advised when driving, especially at night. Standard driving regulations must be observed such as wearing a seatbelt and not using a mobile phone when driving.